Come to the Taste of Tribeca Kickoff Cocktail Party! 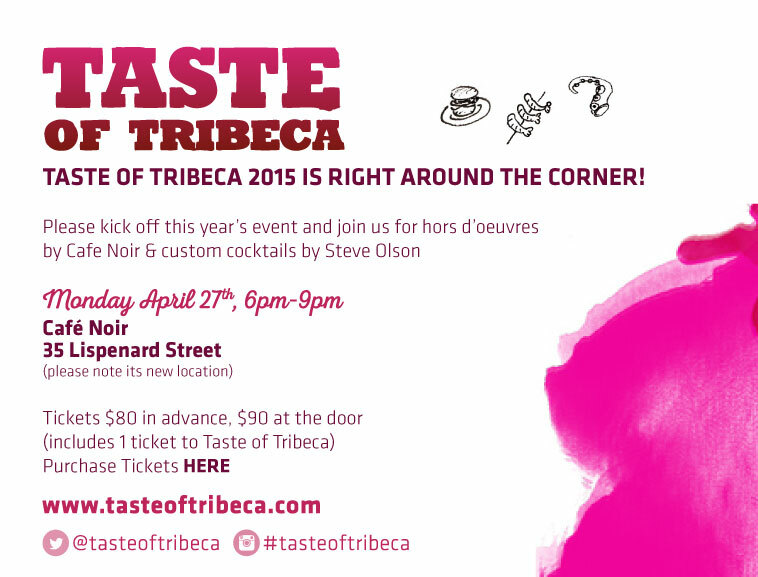 Taste of Tribeca 2015 is exactly one month away! The organizing committee, comprised of parents from PS 150 and PS 234, has been meeting since December to prepare for the big event. It’s a lot of work and we could all use a drink, so please join us at the kick-off cocktail party, being generously hosted by Café Noir at its new Tribeca location on Monday, April 27 from 6PM-9PM. There will be Mediterranean hors d’oeuvres by Café Noir, custom cocktails by Steve Olson, much merriment, and only one or two friendly reminders that we will need your help on Saturday, May 16. Tickets for the cocktail party are $80 ($90 at the door, subject to availability) and include one ticket to TOT. Buy them here – along with extra Taste tickets for your family, friends, co-workers, and neighbors. P.S. TOT ticket prices go up May 1, so act quickly!